I just happened to be about 15 minutes late dropping Grace off to school one day last week. That's not unusually, really. It takes about an hour to feed Grace in the morning, and we don't always wake up on schedule. So, even though it's not unusual for us to arrive late, one thing never changes. As soon as I push Grace into the classroom, several preschoolers stop whatever they are doing to meet her. "Grace is here!" "Grace is here!" 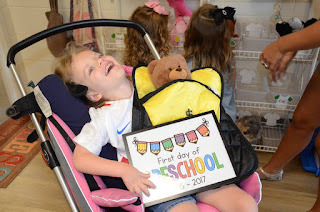 Grace was ALL smiles on the first day of preschool. Family photo opportunity on the first day of school. This is the start of Grace's third year at the Hillsboro United Methodist Church Preschool program, which is also our church. Just before Grace's third birthday, we opted for this particular preschool program, which meets three mornings a week. Grace has always had a full-time aide to help her with activities, and it's been a really great experience for her. Grace's aide, Miss Alex, helping her paint an owl. One thing that I like about the program is how they try to include Grace in as many activities as possible throughout her school day. 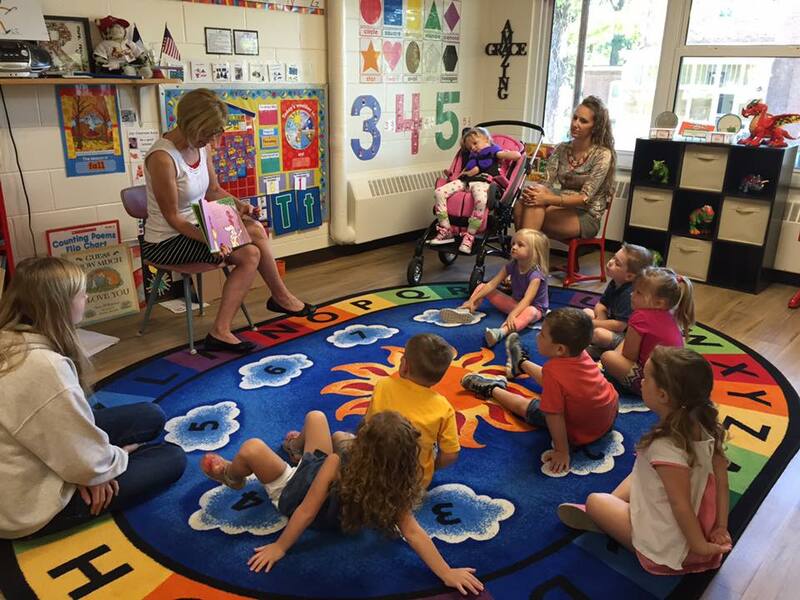 She participates in circle time and story time, and she loves when the kids talk to her. 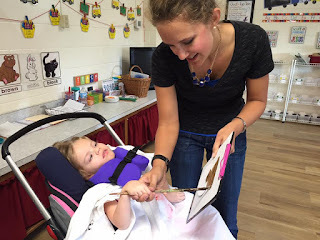 If the class is painting pictures that day, Grace's aide helps her to paint. These kids can't wait for Grace to get to school in the morning. During free play time, often other students will come and interact with Grace, playing doctor or house. One morning, the students even had a puppet show just for her. 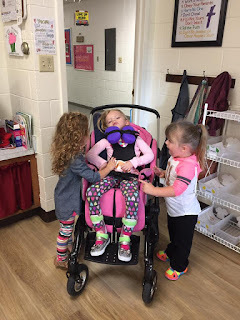 Some days, I think the world would be a much better place if we all thought like three and four-year-old children, accepting those around us, regardless of their limitations or abilities. Enjoying an apple-themed Story Hour with Miss Pam. This year has been tougher than the past two for me in sending Grace to school. 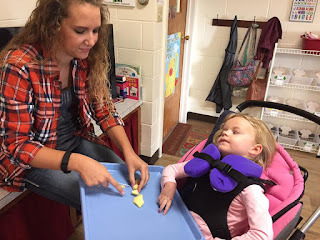 When she first started, Grace could sit up in the school chairs and was more able to participate with the other students. Last year, she was able to sit up in a booster seat for most of the year. But this year, Grace really isn't able to hold herself up anymore. 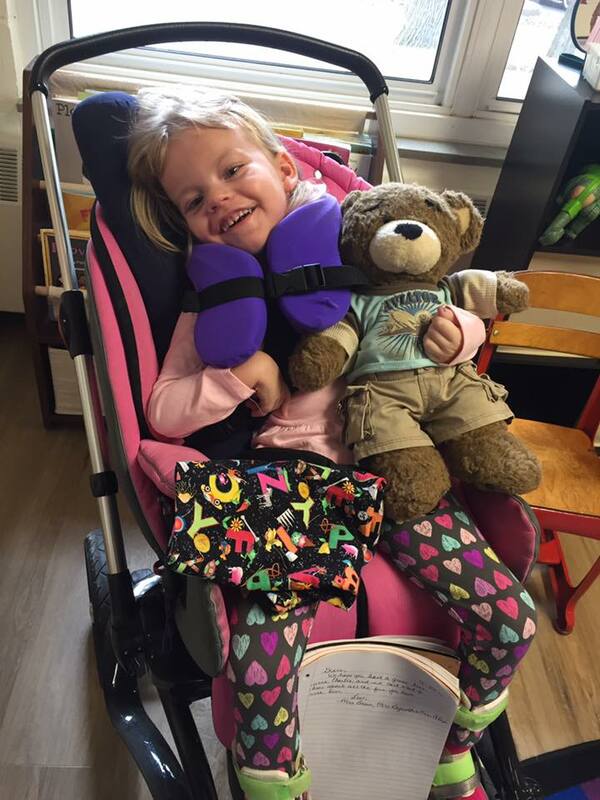 She goes to school in her medical stroller, her head propped up with a neck brace. But the students don't seem to mind, or even to notice, that Grace is a bit different than they are. They simply love her for being Grace, a lesson that will never be learned from any textbook. Grace's class also supports her outside the classroom, like Volley for Grace nights. I'm not sure what the future holds in terms of school for Grace. Our home is only one block from the elementary school in town, and I have such fond memories of walking to school every morning with my friend, Kristin, riding on square scooters in PE, or playing class games like Around the World or Heads Up-7 Up. 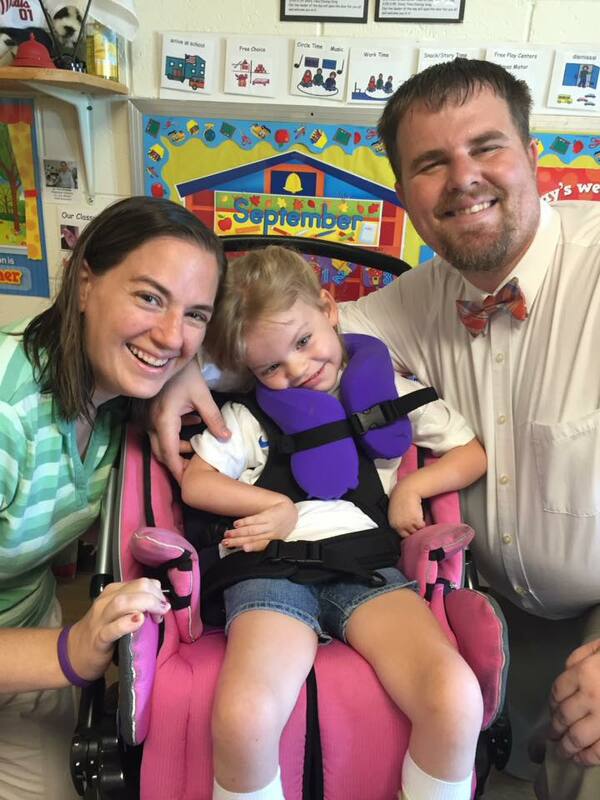 For awhile this summer, every time I drove by the school, I would find myself in tears, sad for all the things Grace would miss out on. Miss Alex helps Grace to cut up an apple during snack time. And while it's okay to have those feelings, what I really needed was to refocus on what's really important. Just because Grace won't be able to share in my memories of school doesn't mean that she doesn't have a lot of opportunities of her own. No, it won't be the same as what other students experience. And I will never have the chance to have her tell me about her school day or what she likes about her teachers. 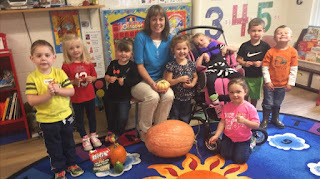 An Ag in the Classroom lesson about pumpkins. But if you spend your time focusing on what Grace can't do, or what any child can't do, you will find yourself missing out on all the things they can. Grace may never know the words to the Pledge of Allegiance or count to ten, but I know for a fact that she enjoys her time at school, and we are so grateful for all the opportunities that her teachers and her students provide for her each and every day. Grace loved taking the class bear, Charlie, home for the weekend. As Grace and all the kids go back to school this fall, always remember that some of the most important lessons are those they might not learn from a textbook. 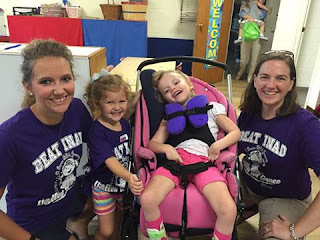 Grace has some really special opportunities at school, because her class refuses to see her limitations, and instead recognizes the potential inside. Maybe we could all benefit from going back to preschool for a bit.